Enter the Golden Age of aviation with the Legacy Aviation Muscle Coupe, where "stick and rudder" flying is the order of the day. 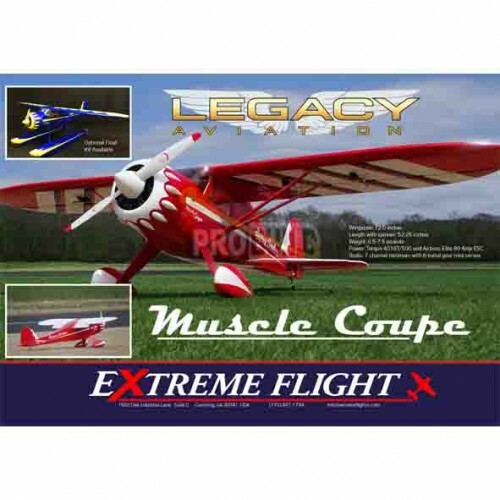 Loosely based on one of the vintage classics from the Golden Era, the Muscle Coupe is a sport-scale aircraft with style, class and the elegance of a bygone era. The Muscle Coupe features a balsa and ply structure with a detailed fiberglass cowl and wheel pants and your choice of two beautiful Ultracote finishes. Featuring a two-piece wing mounted on a carbon wing tube that is easily removed for transport. It was designed around our powerful and reliable Torque 4016T/500 motor and Airboss Elite 80 Amp ESC. The Muscle Coupe is highly pre-fabricated and is easily assembled in a couple evenings. Make no mistake, the Muscle Coupe is NOT a 3D aerobatic model in any way, shape or form, nor was it ever intended as such. It was conceived and designed to be a visually appealing sport-scale aircraft with gentle flight characteristics, capable of basic barnstormer style aerobatics and low and slow flaps-down cruising. The Muscle Coupe was purpose built for scale buffs and sport flyers alike and is a joy to fly! Add a touch of vintage style and class to your hangar with the Legacy Aviation Muscle Coupe. Color coordinated float kit available separately. Weight: 6.5 - 7.5 lbs. Note: A separate Rx battery or independent Battery Eliminating Circuit (BEC) must be used. The BEC on board the Airboss 80 is not sufficient to power six servos. We recommend the Castle Creations BEC (10 amp). Elevator qty. 1 - 18"